Far from healing the divisions rending the Party, the sickness at the heart of the modern Liberal Party has been on raw display through Scott Morrison's first three week's as PM. IN HIS FIRST WEEK as Prime Minister, Scott Morrison announced, with a homely love of nation and just the right touch of jingoism, that he had given all his MPs an Australian flag lapel pin, "to remind us of whose side we’re on". Just in case they forgot. In his second week, he took his flag-wearing MPs to Albury, where Robert Menzies had gathered the fledgling Liberal party in 1944 — perhaps to remind them which party they’re in. Certainly, the dysfunctional, divided, Liberal Party of today bears little resemblance to Menzies’ vision of a party made up of several disparate groups united by their anti-Labor positions into a single political force. It has been an uneasy alliance of post-war idealists, individualists and free-traders ever since. As a Party defined more by what it is against – the Labor Party – than by what it is for, the Liberal Party has been held together by strong leaders such as Menzies, Fraser and Howard, and always prone to splintering into its constituent parts at other times. By his third week, Morrison was presiding over a Party rent by ideological division, personal hatreds and no longer trying to disguise it, despite his best efforts to move on from the obvious question of why Turnbull had been replaced and why he was now Prime Minister. Leaks were appearing daily, helpfully provided by the vanquished, lapel flags were scarce and, during Question Time, the distracted Prime Minister’s own flag appeared upside down. If it was intended as a metaphor it was an excellent one. Whether Morrison was quite the political ingénue in his dramatic assumption of the leadership has been hotly debated in the weeks since. To some, he is a tactical mastermind who cleverly guided the coup behind the scenes, appearing to support Turnbull while intent on assuming the role himself. If this is true, it would indicate a tactical skill he has kept carefully hidden for years. Others point to the more obvious driver in the destruction of Turnbull as the barely concealed rage and eagerness for revenge of the usurped Tony Abbott, who somehow persuaded the baleful Dutton he was leadership material and could successfully mount a coup against his nemesis to prove it. When this pair of keystone plotters came up against the pesky reality of insufficient numbers, they turned to the strong-arm tactics and outright bullying of their own MPs, which are now well known, threatening everything from pre-selections to ministerial positions in desperation to secure the numbers. The sickness at the heart of the modern Liberal Party was on raw display over those fevered days and was never going to stay safely behind Party lines. We see it now cascading through the public arena, with revelations of appalling behaviour against women at every level of the Party, revealing a toxic boys-own culture that will require years of calculated structural and behavioural change to address. In this, the Liberal Party appears immune to the first lesson of PR in crisis management: own the problem and do something about it. Instead, they remain resolutely in denial and bunkering down. It began with the Western Australian Senator Linda Reynolds’ powerful speech detailing "the madness that has taken hold of some of my colleagues". Reynolds denounced the behavior she had witnessed during the leadership challenge, saying, "I do not recognise the bullying and intimidation that has gone on". The Victorian MP Julia Banks then announced her resignation as the member for Chisholm, also citing bullying. Victorian Liberal president Michael Kroger responded that "people do speak strongly" in politics and newly minted Prime Minister Scott Morrison said he was concerned for "Julia’s welfare and wellbeing". Neither acknowledged bullying was a problem in the Liberal Party. Former deputy leader Julie Bishop made no such pretence, saying said that some of the behaviour, "wouldn’t be accepted in any other workplace in the country". "... bullying, betrayal and backstabbing have been the hallmarks of one of my state Liberal colleagues, Gareth Ward, over the past six and a half years." "This is not the first time Gareth has flexed his vengeance on strong Liberal women … He doesn’t just get even, he annihilates anyone who opposes him." It was searing stuff and yet the Liberal Party continues to deny that gender-based bullying is even a problem. 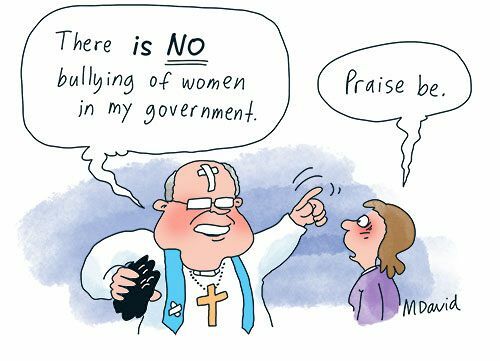 From the Prime Minister down, as Liberal women call out "bullying, intimidation and undermining", senior Liberals have denied there is a problem and even point to the women themselves for failing to deal with the "tough business" of politics, as Morrison described it. The federal Liberal vice-president, Teena McQueen, said that women MPs should "put up or shut up", as if the "rough and tumble" of politics excuses everything from intimidation to branch-stacking. Emeritus Professor Jenny Hocking is Distinguished Whitlam Fellow at the Whitlam Institute, Western Sydney University; Gough Whitlam’s award-winning biographer; and author of 'Gough Whitlam: A Moment in History' and 'Gough Whitlam: His Time'. Her latest book is 'The Dismissal Dossier: Everything You Were Never Meant to Know About November 1975 — The Palace Connection'. This article was originally published on Pearls and Irritations on 19 September 2018 under the title 'JENNY HOCKING. ‘Bullying, betrayal and backstabbing’: Can the Liberal party survive?' and has been republished with permission. Get your quota of factual news. Subscribe to IA.